Clarke University Associate Professor of Art Jessica Teckemeyer received the Best of 3D Award at the Indianapolis Art Center “Art of the Heartland” exhibit. The exhibit features work from some of the Midwest’s most innovative and prolific artists. The exhibition serves as the Art Center’s survey on the state of contemporary art in the Midwest, highlighting artists from Indiana and surrounding states. This year’s exhibition was juried by Indy Moca’s Gallery Director Mike Barclay, who selected 80 pieces out of a pool of over 650. 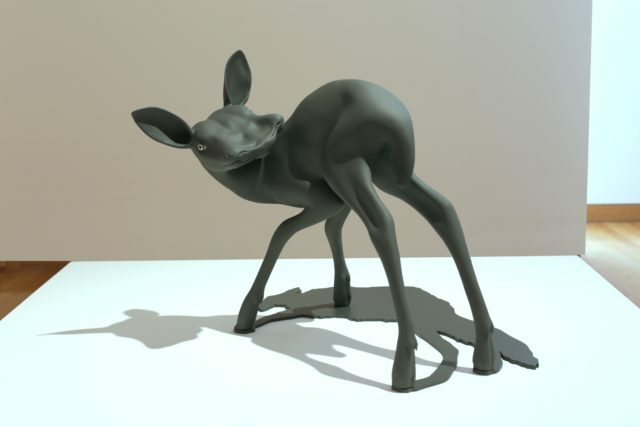 Teckemeyer’s sculpture is titled “Human Shadow” and is a newborn deer projecting the shadow of a wolf. Teckemeyer creates mixed-media animal sculptures to explore the multiplicity in human nature. Her highly finished artworks feature dramatic, glossy human eyes to clue viewers in to the introspective nature of her ideation. Her research is immersed in psychology, mythology, and monster theory. The resulting concepts reveal the collective unconscious through portraying archetypes. Teckemeyer is fascinated by our imperfect nature and works to capture vulnerabilities.